The first Nuns & Nones residency is underway! In November 2018, five “Millennials” moved into Mercy Center in Burlingame, California, to live alongside the Sisters of Mercy. As a 6-month experiment, it is the first pilot residency of its kind for Nuns & Nones, intended as a bigger container for the conversations, relationships, mutual learning and possibility that have emerged after two years of organizing. Learn more about this groundbreaking effort here on the Mercy Center website, in this NCR article, and on our own blog. In the meantime, enjoy some images and reflections from our residents. 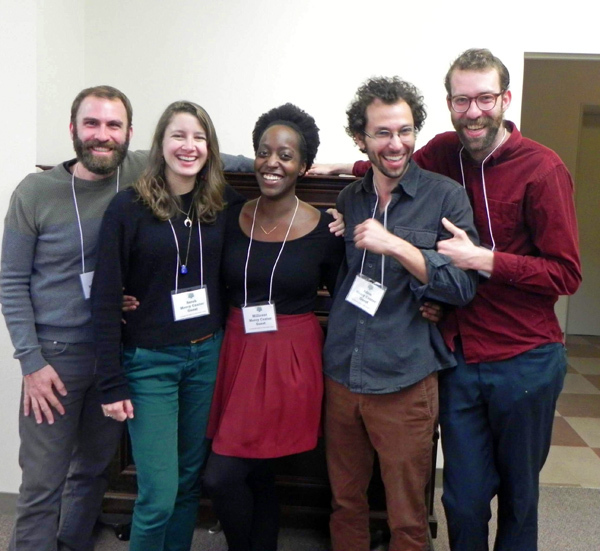 Residents Alan Webb, Sarah Bradley, Milicent Johnson, Adam Horowitz, and David Bronstein. Sisters, residents, and friends prepare latkes for Hannukah. We are searching for one or more partner communities with which to build deeper relationships and explore creative, intergenerational approaches to forwarding and stewarding mission, charism, and sacred space. To start, we are looking for a value-aligned community of women religious, asking questions about the future, that would be excited about inviting in 4-8 millennials for a 3-9 month learning residency—a period of listening, sharing, and relationship-building. Creating a local hub for learning, contemplation, and action together, co-inhabiting living space or simply concentrating members of our team together nearby. Creating spacious time for listening, discerning, and learning alongside one another. Inviting other like-hearted allies with relevant models or skills to share for visits or small gatherings. In the longer-term, we have all kinds of big dreams! Click the button below to learn more about us, the invitation, and explore whether this might be a fit for your community! How might THE critical need for inclusion, community, communion shape our life, our response as religious women? How might we support millennials in their efforts to respond to this critical need today through their own intentional communities, their own outreach? How might we support each other, be engaged with each other in new ways?